Concussion impact is the same in both male and female high-school soccer players, according to a study published Tuesday in the Journal of Neurosurgery Pediatrics. 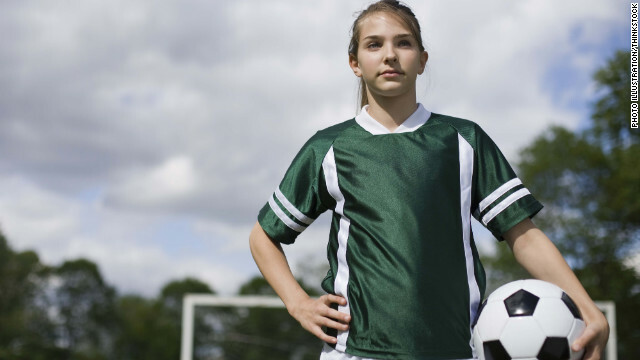 The only difference researchers discovered was that female soccer players report more symptoms post-concussion than male players, says lead study author Dr. Scott Zuckerman, suggesting social biases maybe the reason. But whether or not females actually suffer more serious injuries from concussions hasn't been determined. Researchers looked at the neurocognitive scores in 80 high school soccer players, 40 girls and 40 boys of similar age, medical history, education, prior concussions, pre and post concussion testing timing. In this study baseline and post-concussion scores of verbal and visual memory, visual-motor speed, reaction time, impulse control, as well as the total number of symptoms were all examined. Zuckerman, who's also a neurosurgery resident at Vanderbilt University Medical Center, says previous studies that used a larger number of athletes didn't control for age, grade, education level or, most importantly, specific sports. Female soccer players are second only to football players in the number of concussions they report, according to the Centers for Disease Control and Prevention. About 200,000 girls participate in high school soccer every year. "If you've had a head injury, you are not doing anyone a service by hiding symptoms or an injury. Let someone know," says Zuckerman. According to the National Athletic Trainers' Association, headaches are the most common symptoms for male and female athletes who have experienced a concussion. Beyond that, males experience more cognitive symptoms while females experience more neuro-behavioral and physical symptoms. The same recovery time is needed for both sexes. Not only did the study find no statistically difference between the males and females before and after concussions, it also found no statistical differences in neurocongintive function, as was tested, before and after concussion. The tests for neurocognitive function included verbal memory, visual memory, visual motor speed, reaction time, and impulse control. In other words, by the tests used, there was no neurocongnitive impairment as a result of the concussion. The average time for the after-concussion testing was 7.18 days for the females vs. 5.40 days for the males, which was fond to be a statistically insignificant difference. No neurocongnitive impairment nominally 6-7 days after concussion for a total of 80 cases seems a tad surprising to me. Your interpretation of the results, "there was no neurocongnitive impairment as a result of the concussion" is incorrect. Just look at table 1 in the study. Each gender shows findings of impairment based on pre- and post-concussion scores. You are just misinterpreting the table, as there were no significant differences when specifically looking at gender variable. When the studies were still far and few about football players, I wondered about soccer players. A couple of years ago, I emailed one of the Sports Illustrated writers who covers soccer and asked if they were aware of any research being conducted on soccer players. The author didn't know what I was talking about. Considering how hard players can crash into each other and the number of headers they do, it only makes sense that concussion would be a challenge.